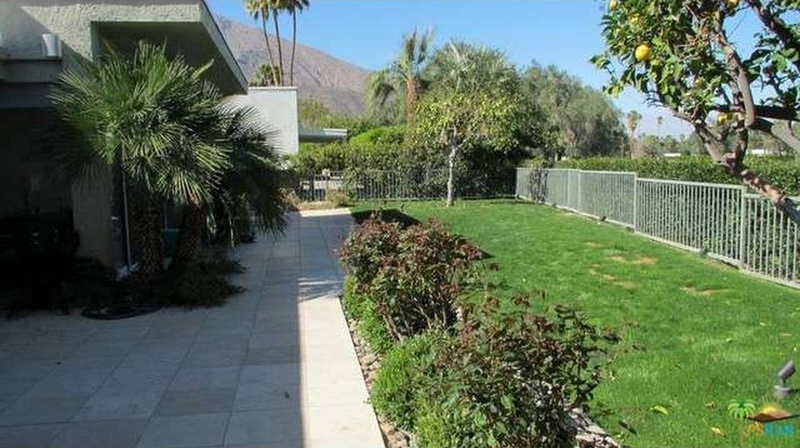 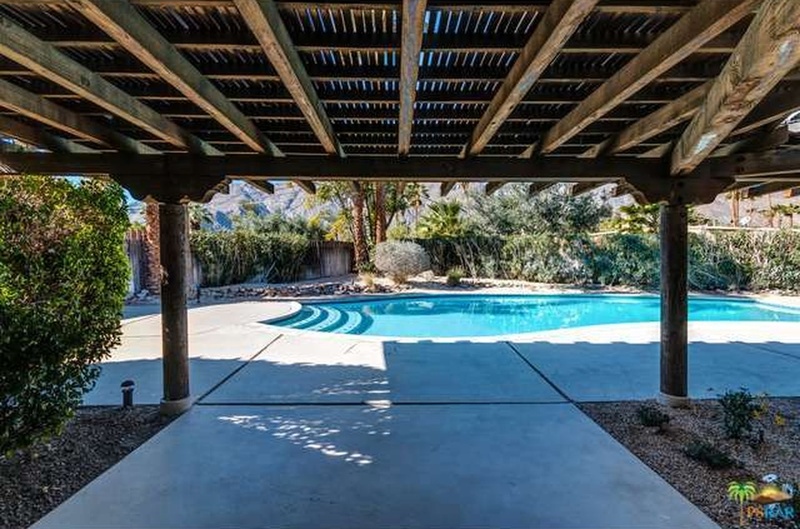 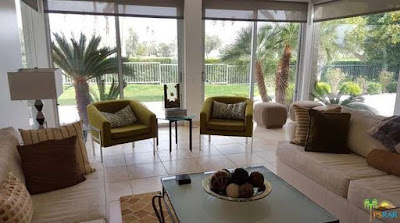 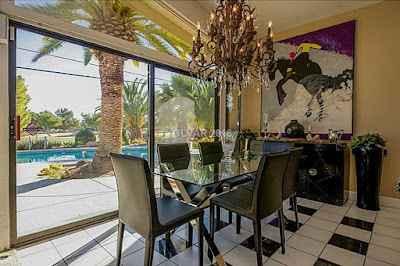 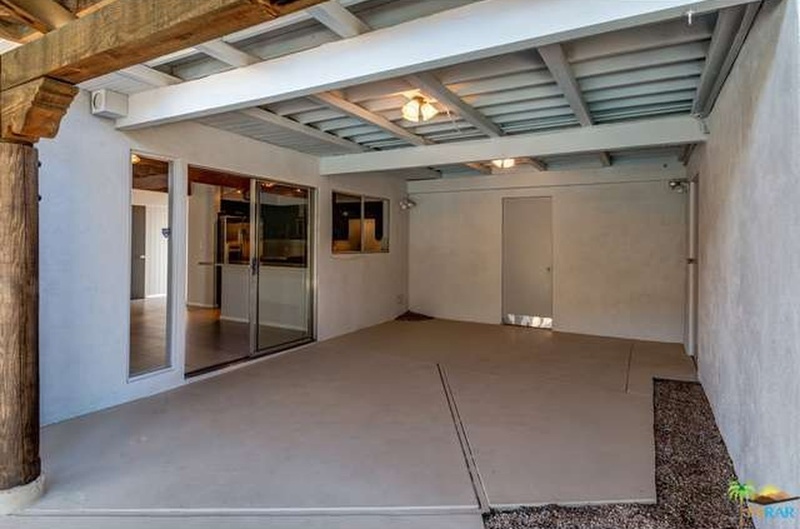 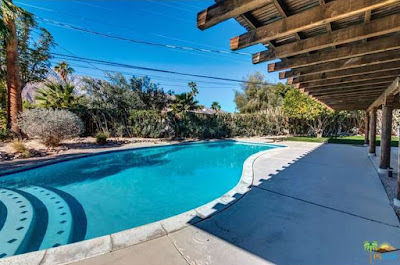 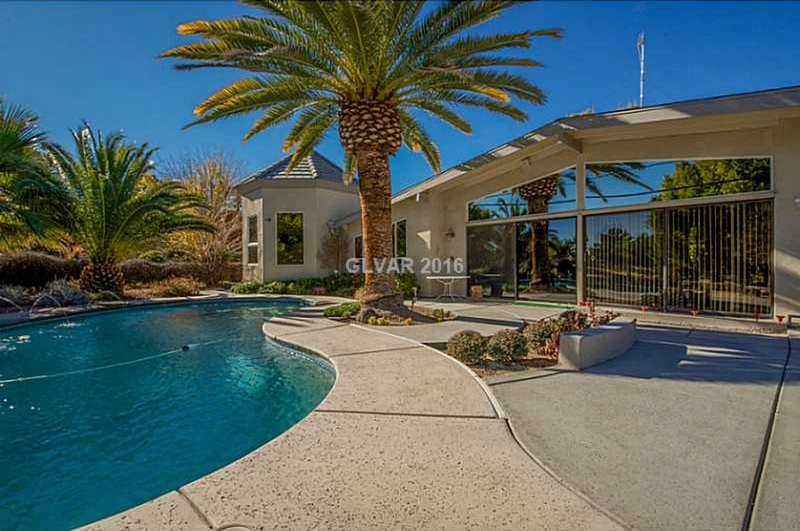 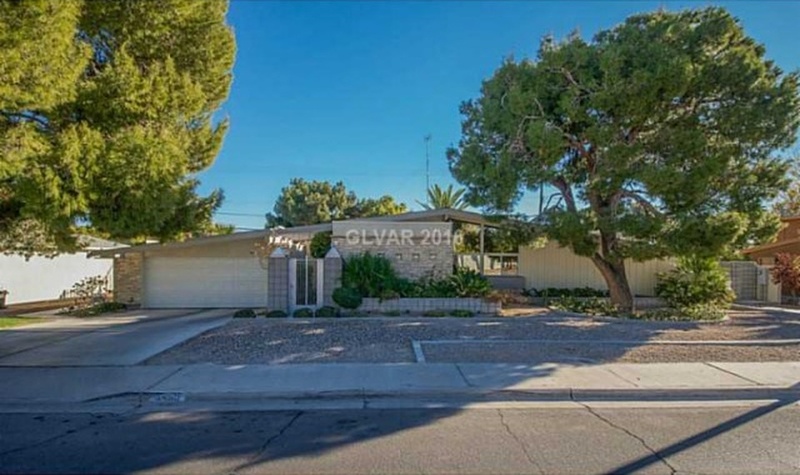 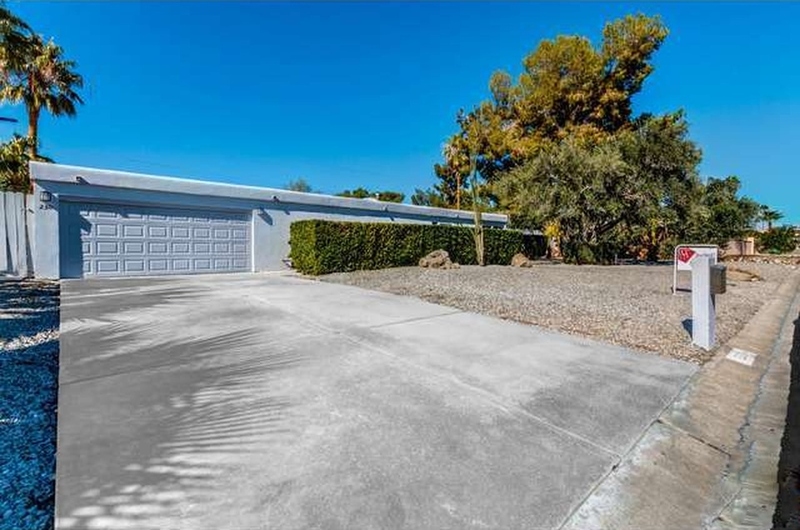 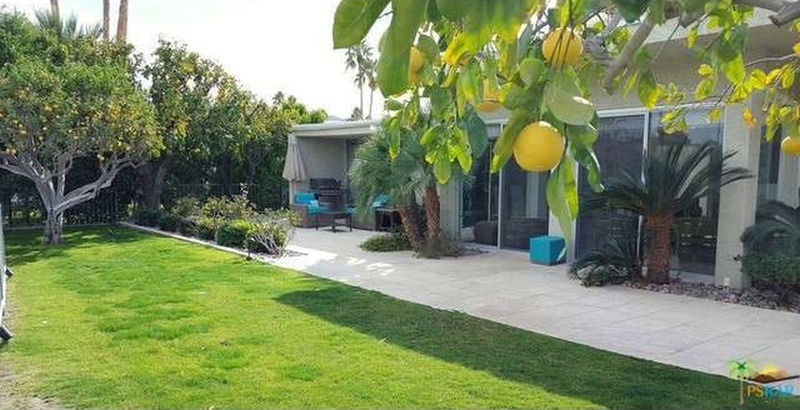 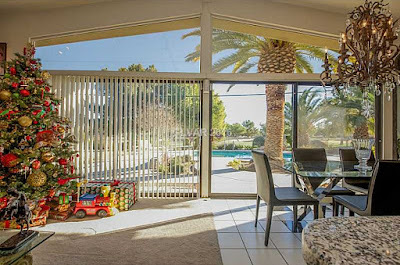 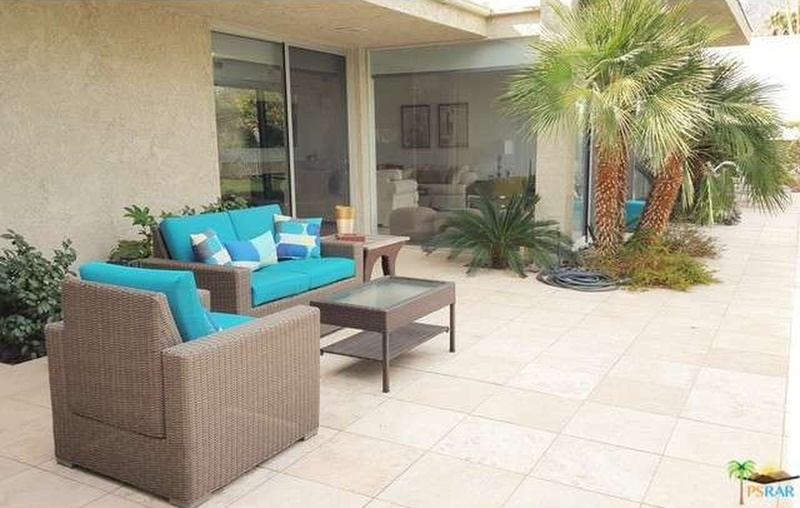 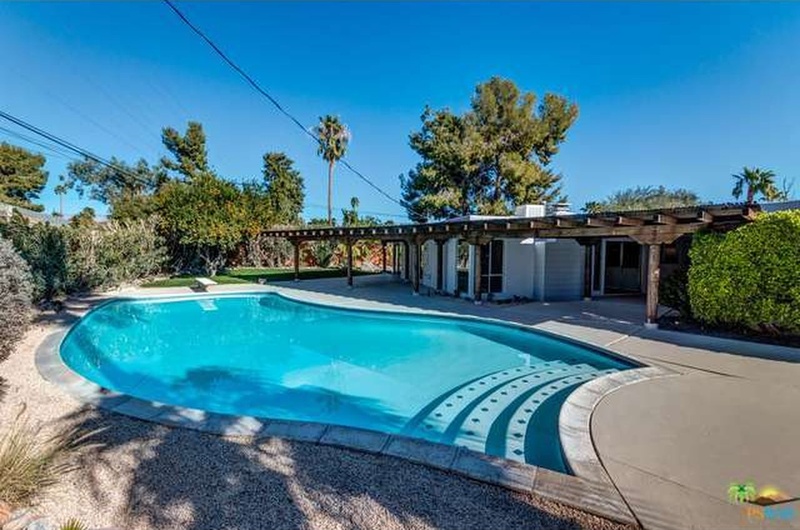 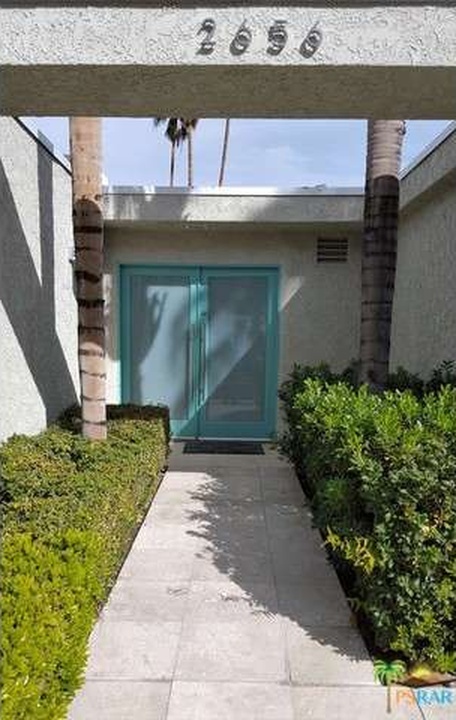 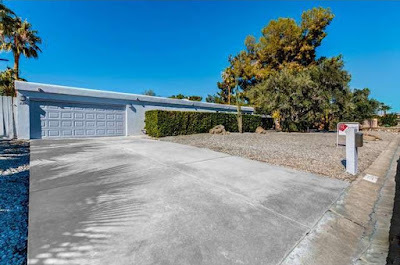 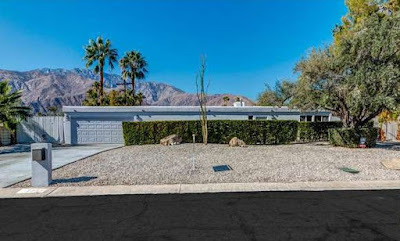 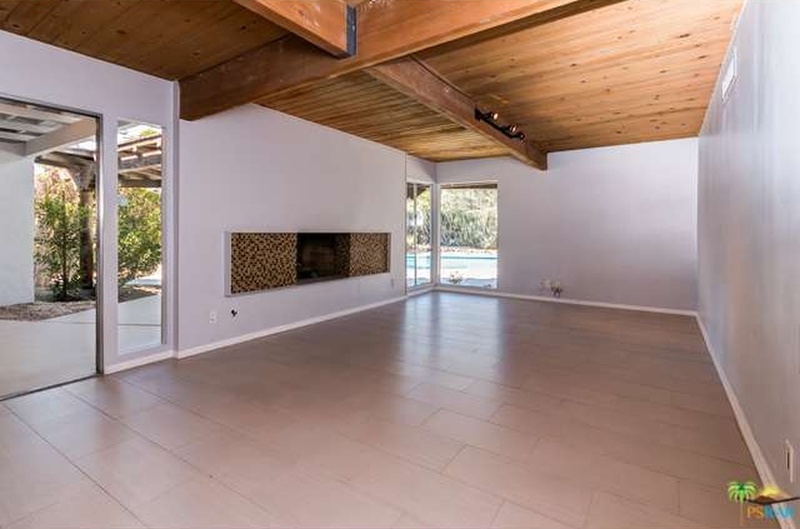 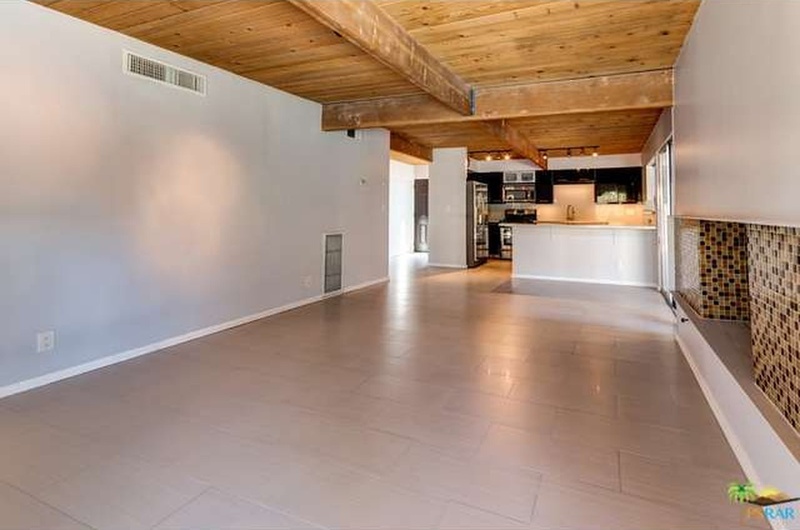 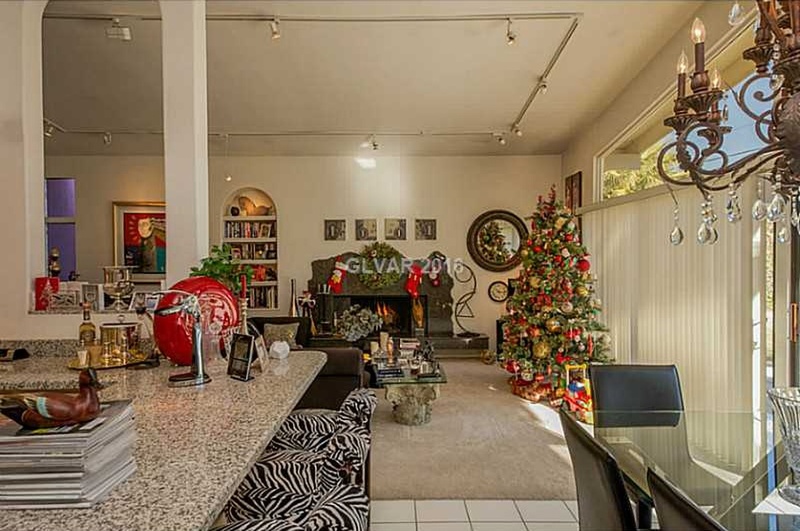 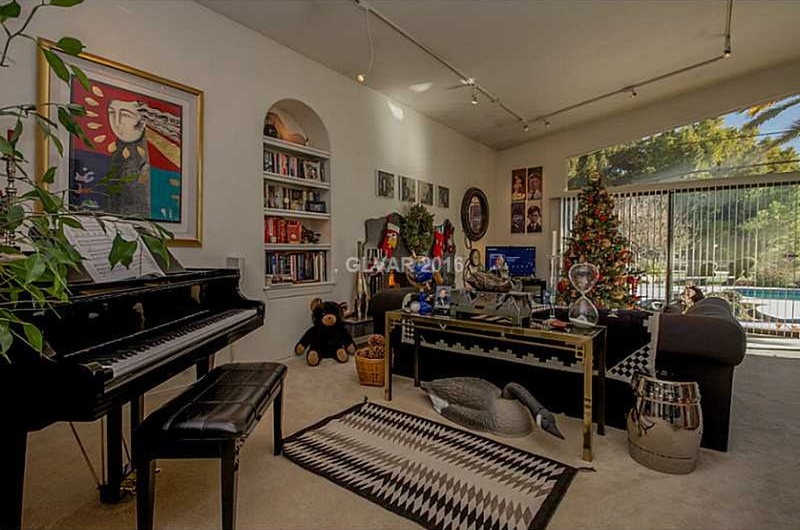 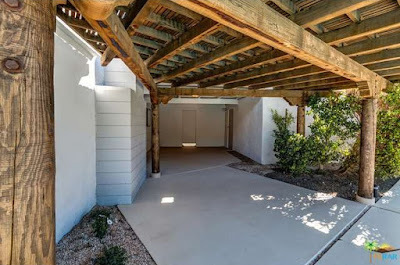 Built in 1963 is this midcentury Palmer & Krisel-designed home sited on the 9th fairway of the Las Vegas National Golf Course in Paradise Palms. 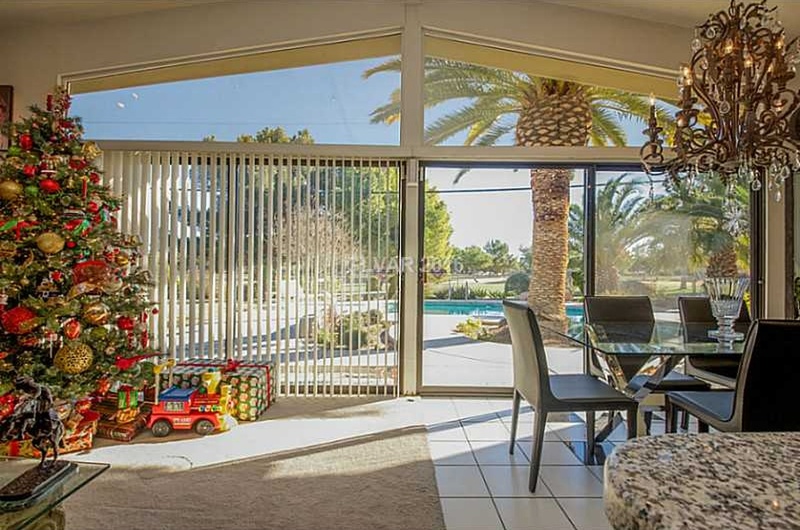 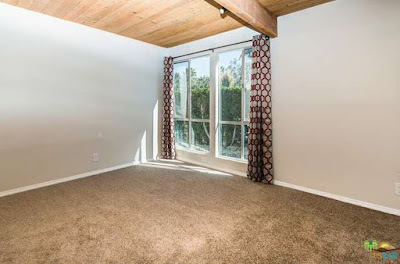 Expanded to 2,484 square feet, this home features four bedrooms, three bathrooms, a two-car garage and an in-ground pool with east-facing golf course views from a 12,600 square-foot lot and carries an asking price of $400,000. The front of the home features a small, square addition covered in stone veneer adjacent to the front entrance. 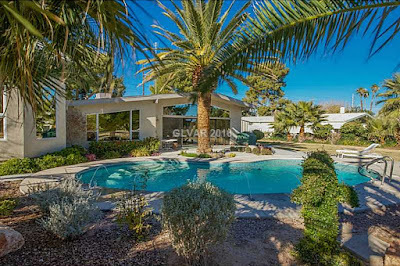 The wide, west-facing front yard features a pair of mature pines offering shade and passive solar for the home. 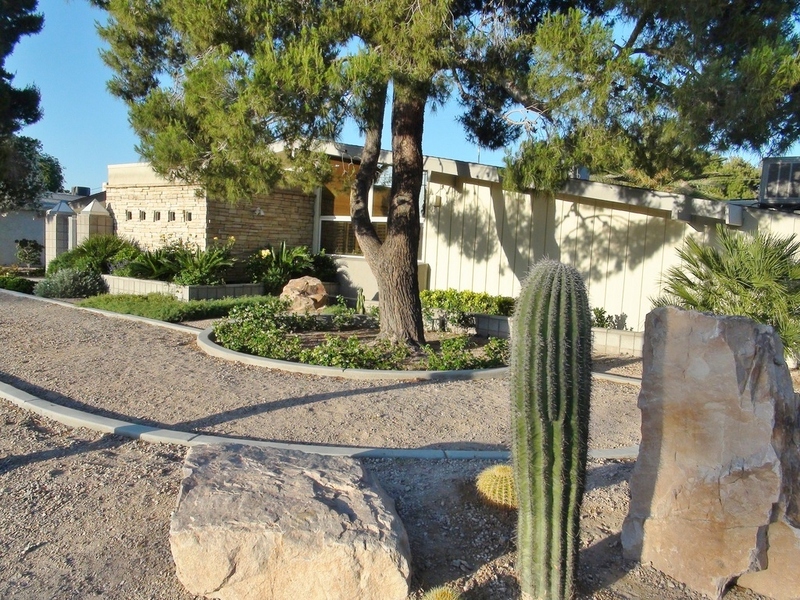 The rest of front yard features massed plantings and rockscape. 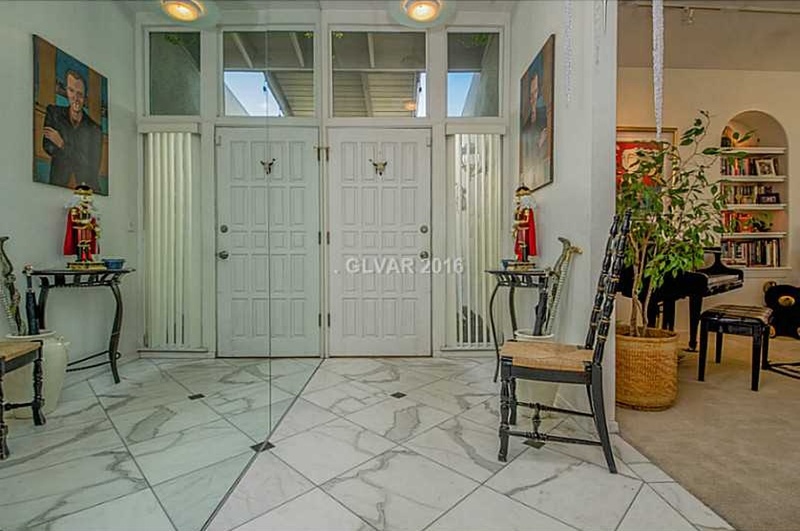 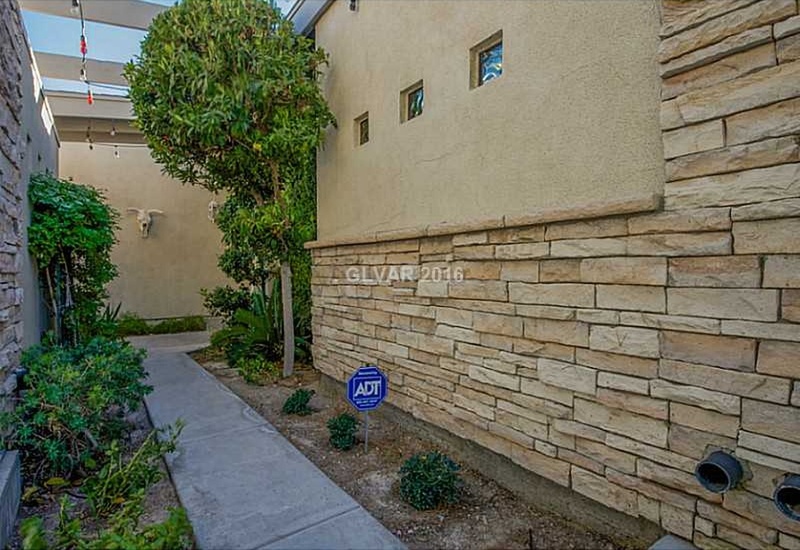 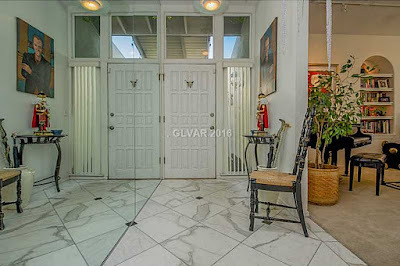 A gated courtyard entry lined with lush plantings leads to the front door. Entering the home, the living and dining rooms sits at the rear of the home, overlooking the swimming pool and golf course beyond through large sliding glass doors and clerestory windows. 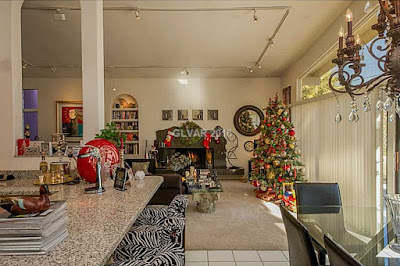 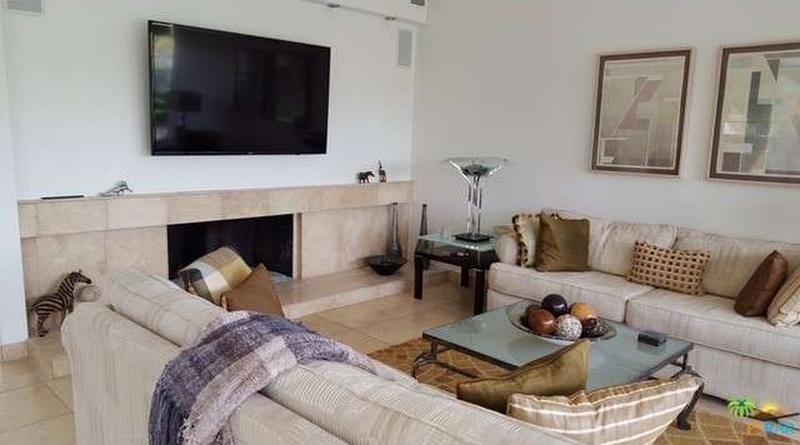 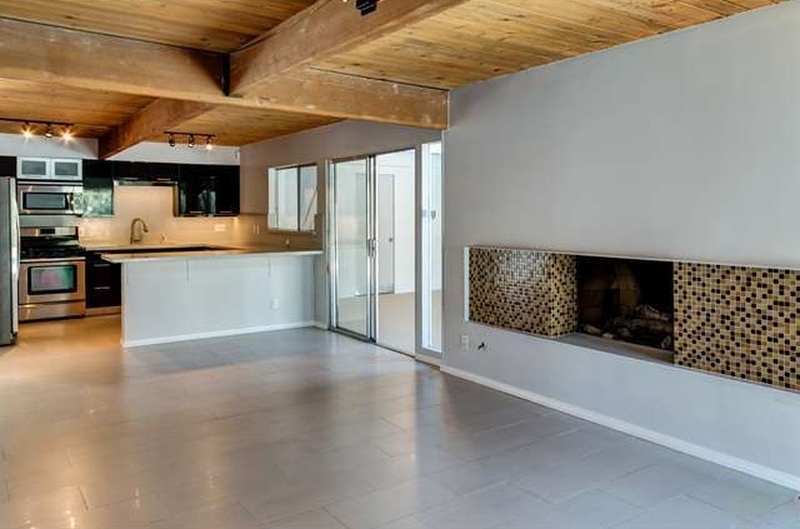 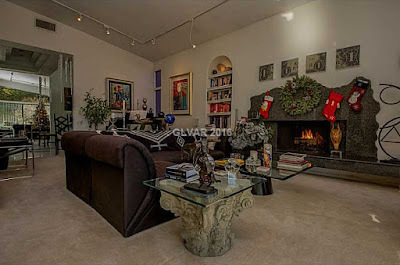 The original signature Krisel modernist fireplace has been removed and replaced with a flush-mount granite surround, while the floating hearth remains. 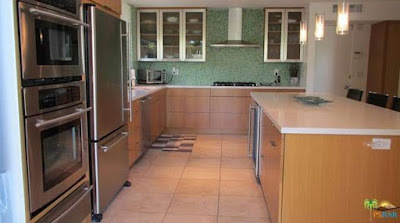 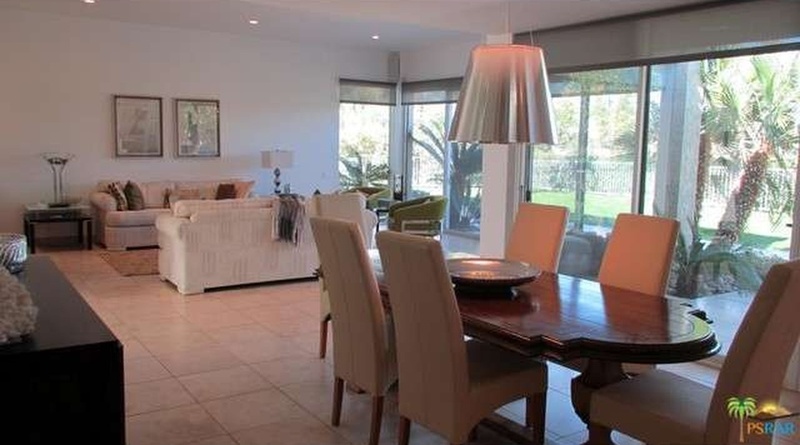 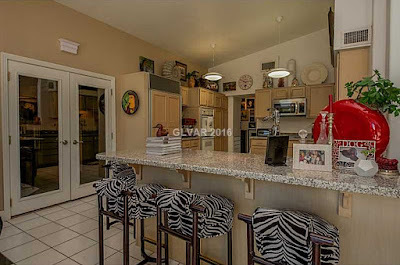 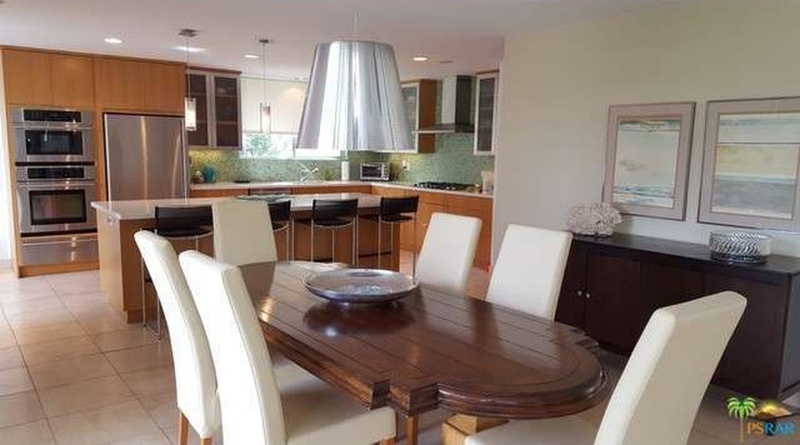 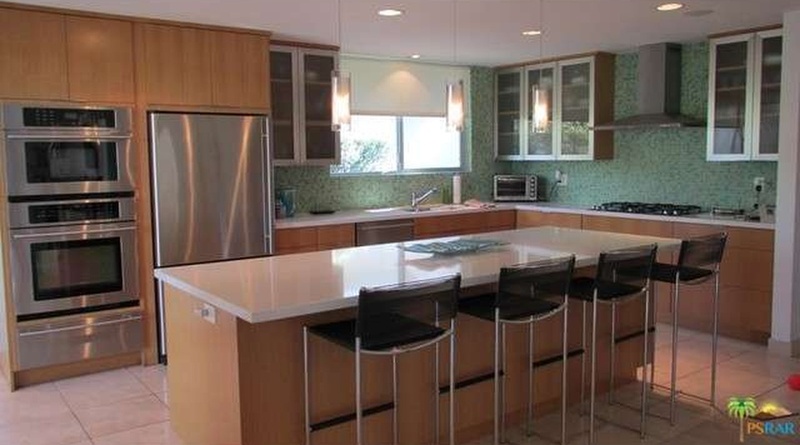 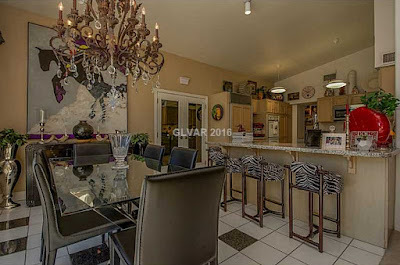 The kitchen is open to the dining room and provides views to the golf course. 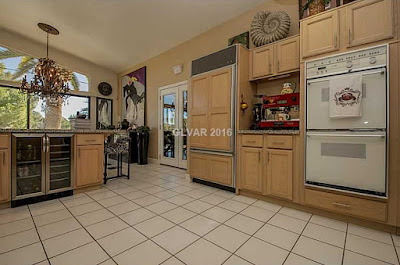 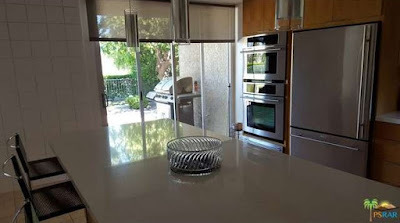 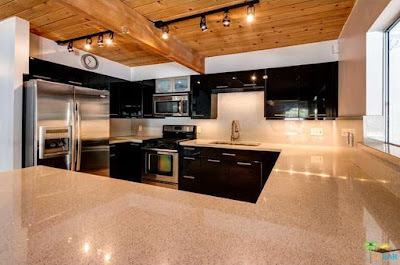 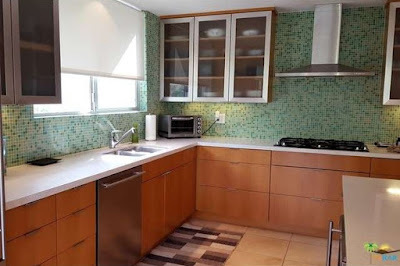 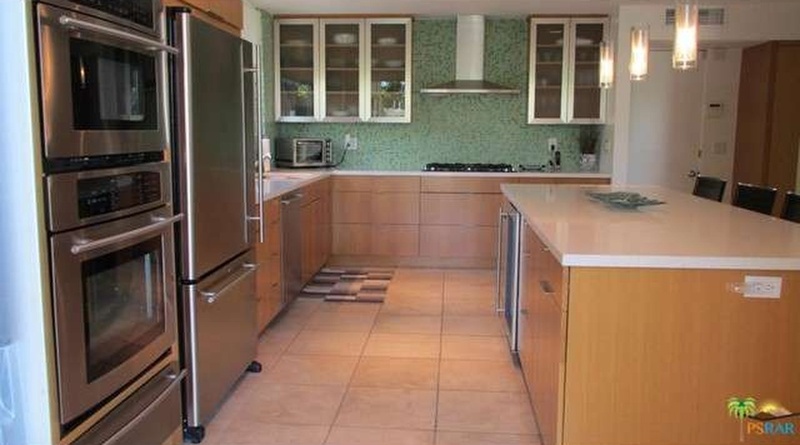 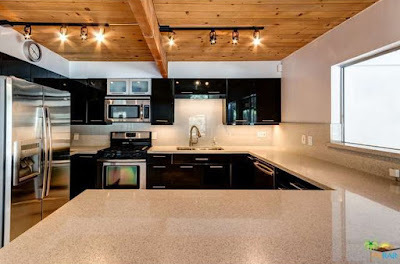 The cabinetry has been updated with traditional raised-panel cabinets, granite counters and a combination of stainless steel, white and wood-faced appliances. 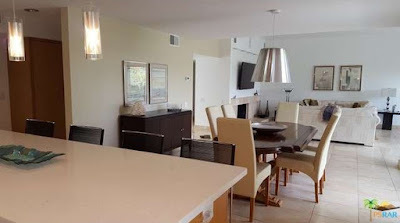 A den addition sits off of the kitchen and dining room, and overlooks the golf course and features its own private bathroom. 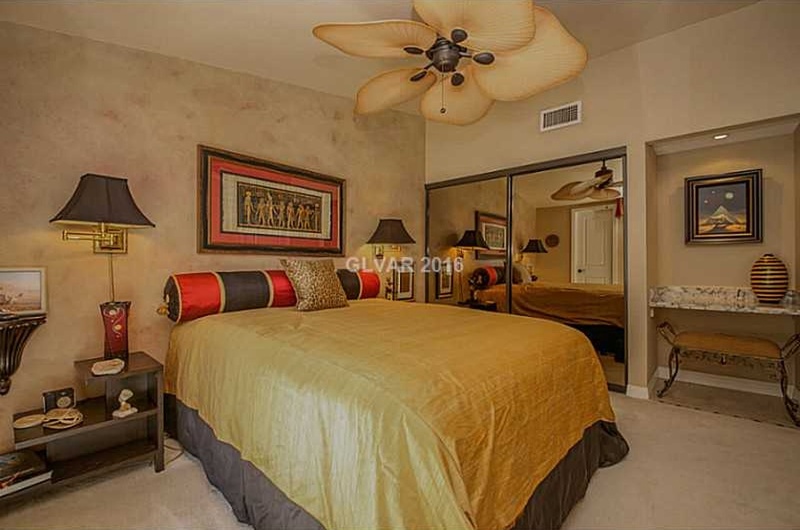 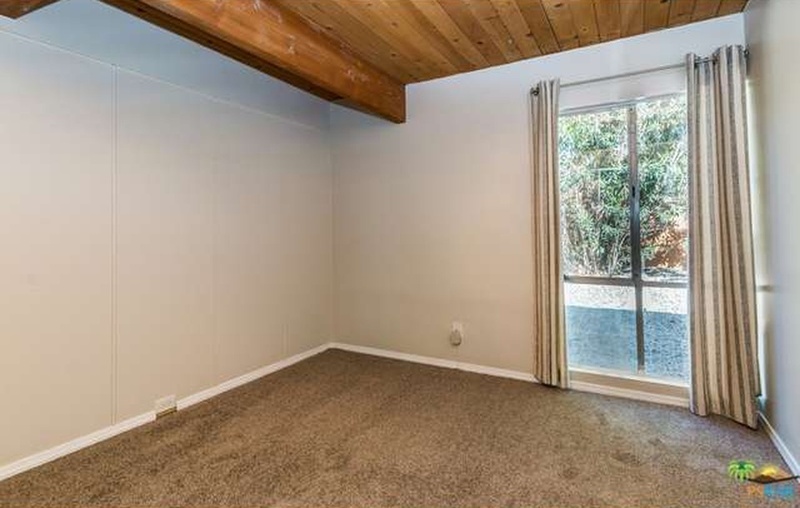 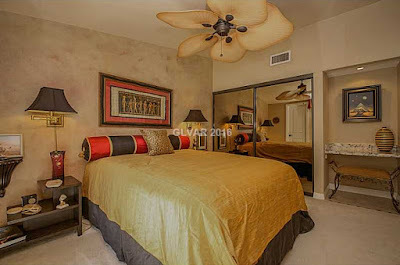 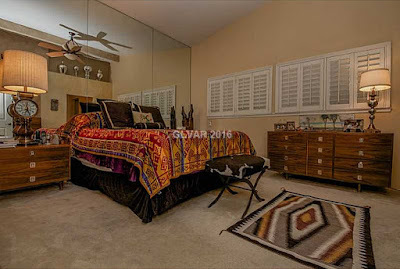 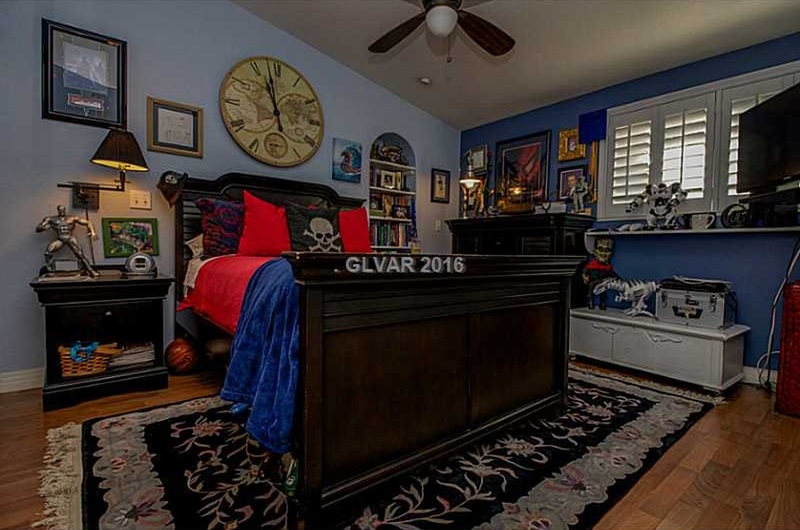 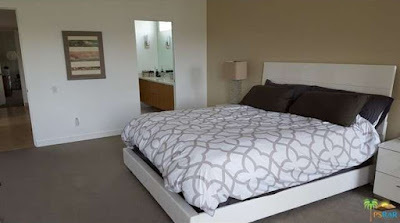 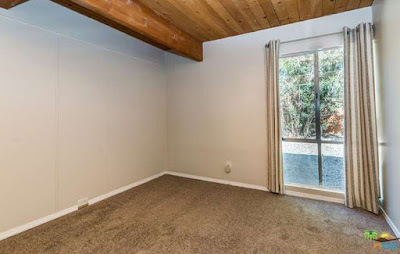 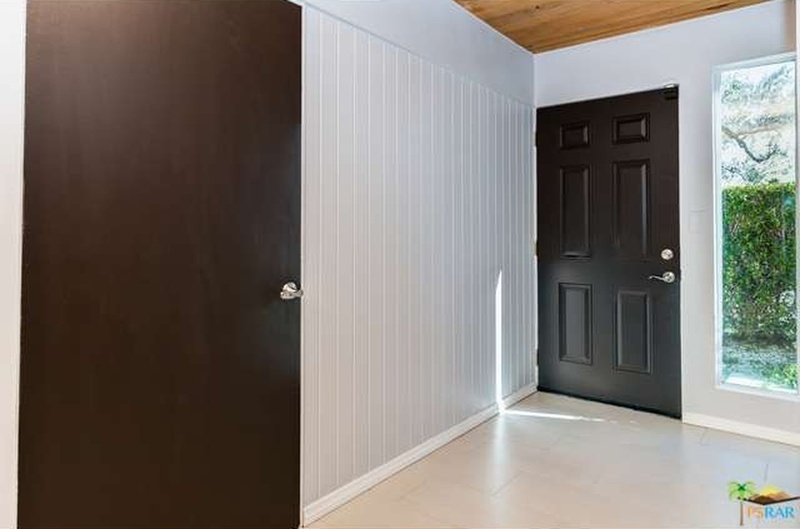 The mirrored master bedrooms sits at the front of the home, and features a large walk-in closet addition that projects into the front yard. 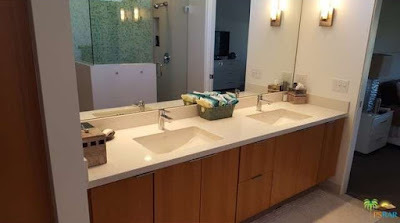 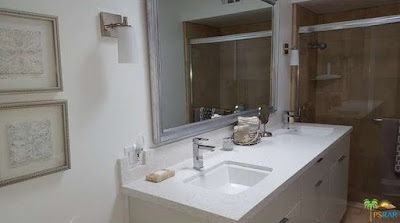 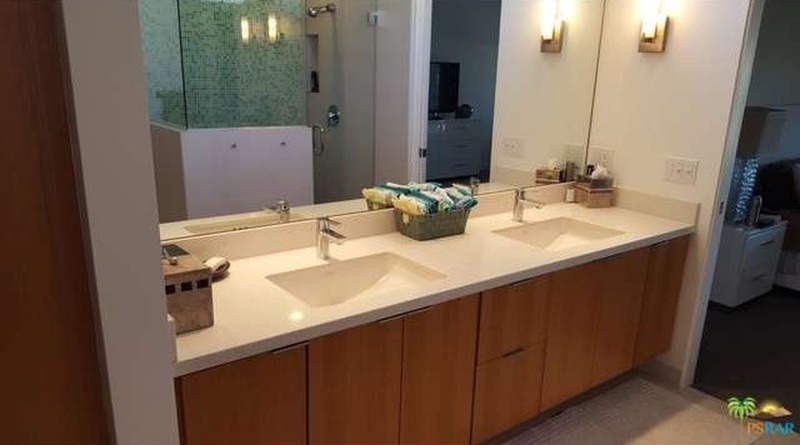 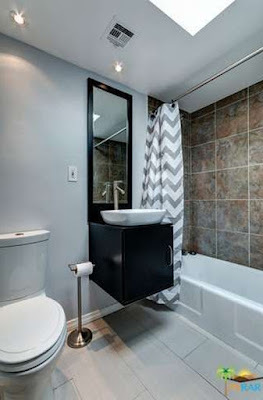 The addition also expands the master bathroom, allowing for additional storage and a second sink area. 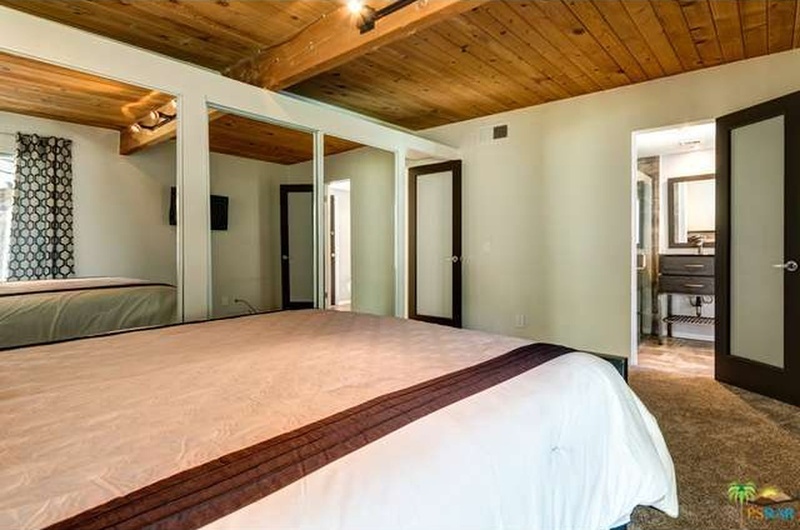 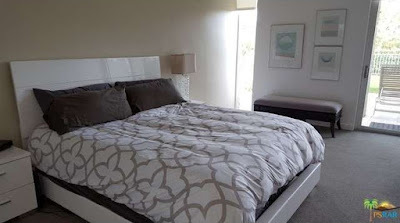 The remaining two guest bedrooms sit at the side of the home, and have had their signature floor-to-ceiling windows shortened. 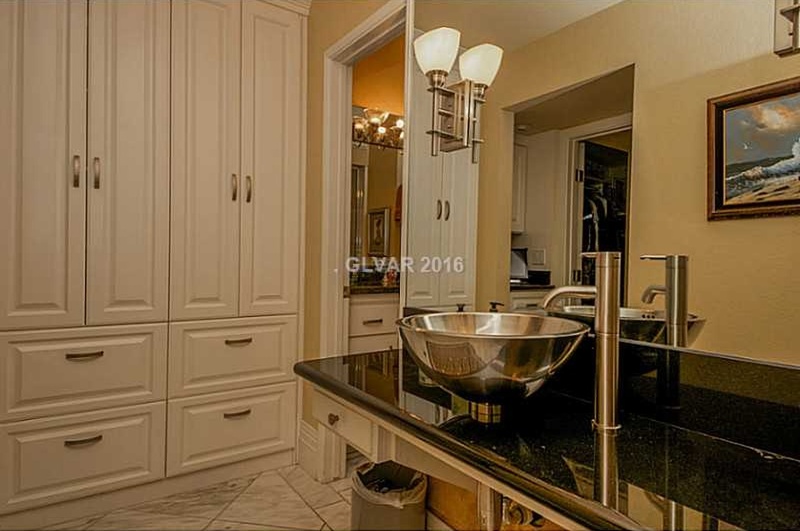 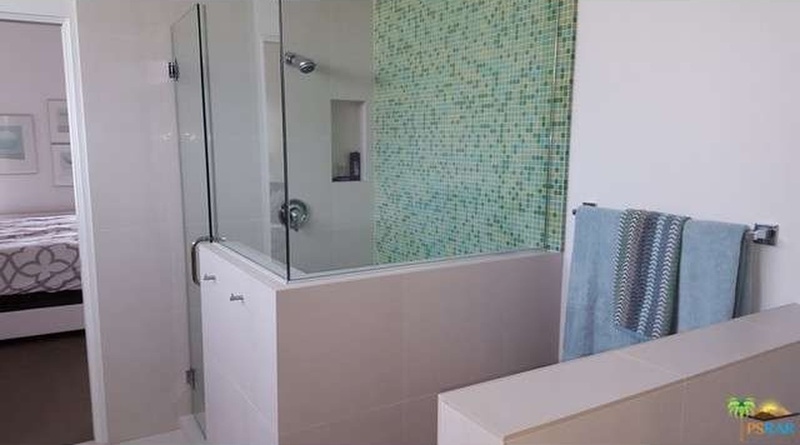 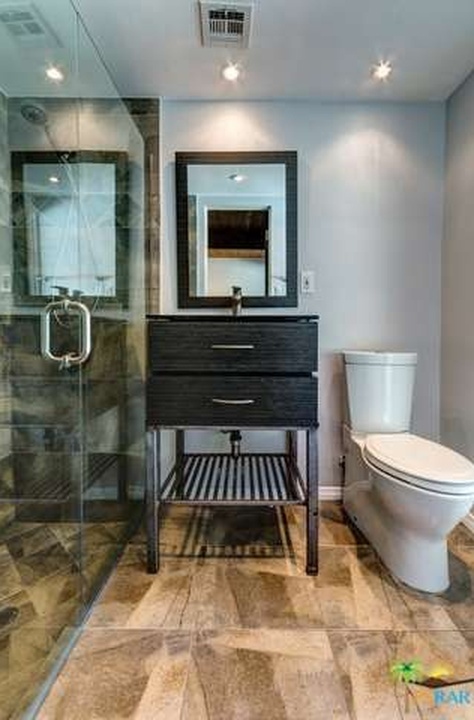 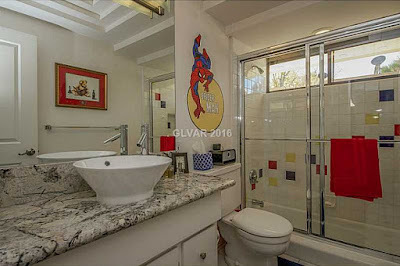 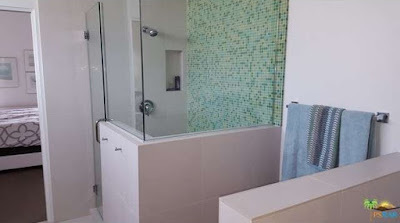 The guest bath sits between the two secondary bedrooms, and still holds its original signature Krisel sunken bathtub, which is the only original feature left. The backyard features a curvilinear swimming pool at the center of the yard, accented with palms and shrubbery. 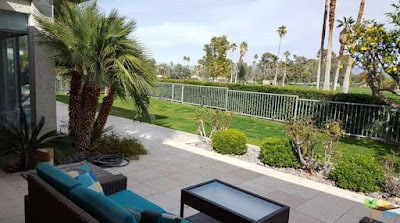 A large turf area sits to the north of the pool, and a chain-link fence allows for open views to the surrounding golf course. 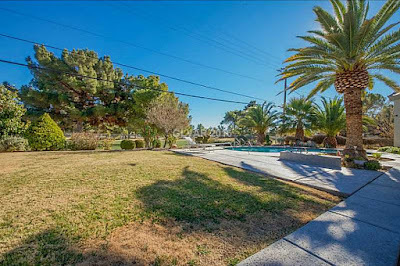 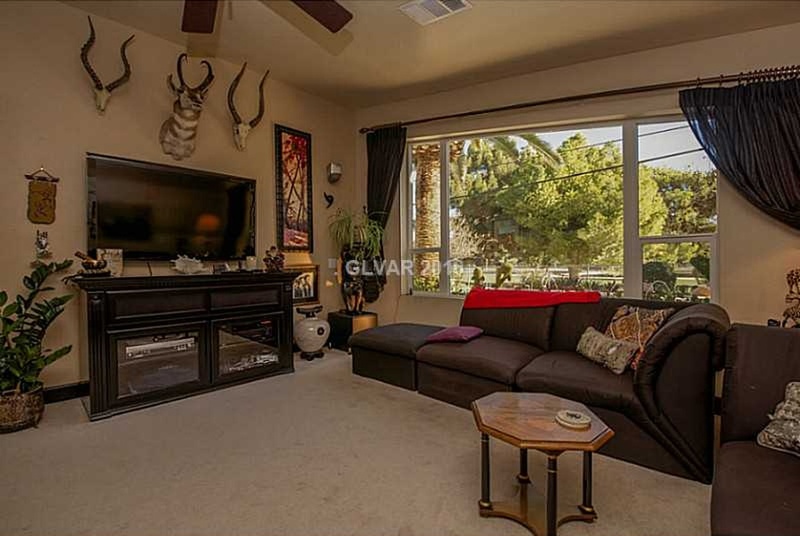 There’s a lot to take in on this property, and the views from the backyard make this property one to consider.